London’s Music Scene: Where to Shop and Where to Catch a Show! 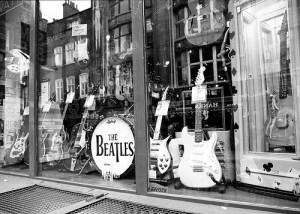 For the avid music lover visiting London, Denmark Street is where you can find an array of music stores filled with vintage and modern gear. Denmark street is also home to various music venues and clubs such as the 12 bar club which hosts live music on a nightly basis. Back in the 1950’s and 1960’s artists such as The Rolling Stones and Jimi Hendrix would set up shop here and produce their first recordings at Denmark Street’s Regent Sounds Studios. Elton John wrote his first released song ‘Your Song’ here. Outside of Denmark Street popular haunts include Camden Town in North London, where you can find music venues such as Dingwalls and bars always filled with live music such as Camden’s Blues Kitchen. St. John’ Wood has been a hotspot for tourists since The Beatles first recorded their Abbey Road LP at the infamous recording studio there and took what is now one of the most iconic album covers of all time, outside on the crossing of Abbey Road. You can visit Abbey Road and many more famous London music landmarks on London Magical Tours’ Private London Tours. The studios and much of the recording gear are still in use today for recording and mastering purposes for the budding musician in us.